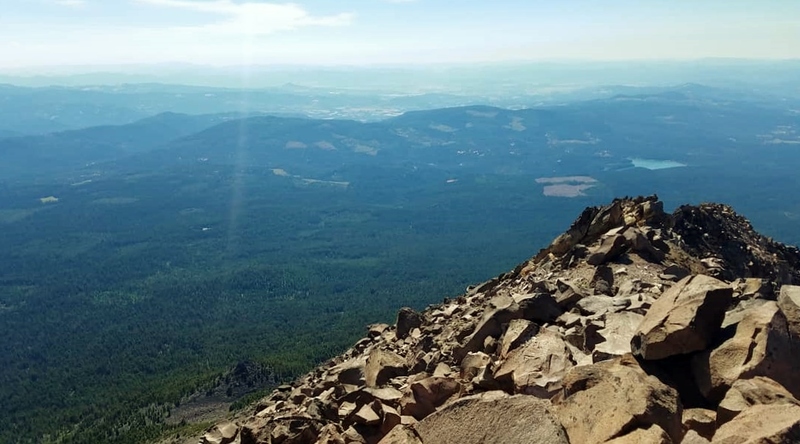 Mount McLoughlin is one of the most stunning and recognizable natural landmarks in the Rogue Valley. With an elevation of 9,493ft it is the sixth highest mountain in Oregon. It is a volcano, and the entire mountain is littered with volcanic rocks. The mountain is located between Medford and Klamath Falls in the Sky Lakes Wilderness. But all that aside, I have looked on at Mount McLoughlin with wonder. I wondered, what is up there? What is it like to be on that mountain? I'm not an experienced hiker, but I had to do this. I made four separate treks on the mountain, but only made it to the summit on the most recent hike. My first climb was August 2017. My decision to experience the mountain was a spur of the moment choice. I started on the trail later than was needed to make the summit and descend before darkness fell, so I descended before summiting. My second attempt was in November 2017, one day after another hike which I had achieved a minor injury. The cold and my injury were too much, so I gave up early on the trail. A view from the ridge, high winds and clouds enveloped the top of the mountain. June this year I was back on the mountain. Little was in bloom, and it was fairly cold. I had arduously reached the ridge, but dark clouds were moving in around the mountain from the East. Thunder was rumbling from the distance. Before I knew what was happening, the storm was right overhead. Snow and lightening prompted me to make a swift descent! In my slightly panicked haste, I lost the trail several times on the way down through the subalpine zone (dominated by many large basalt fragments, dwarf trees, and a poorly discernable trail). It was not ideal. I encountered much more pleasant weather on the mountain this July. Driving up to the trailhead on a pitted rocky dirt road, I passed by so many wildflowers in bloom! It was exactly what I needed to boost my spirits and give me the optimism I needed to reach the summit, finally. Gleefully on my way up the trail, eyes mostly to the ground, I spotted a delightfully intriguing plant! Of course I encountered many interesting plants, but one that stood out among the rest was the parasitic coralroot. Instead of photosynthesizing, these orchids get all they need from relationships with ectomycorrhizal fungi. The fungi gets what it needs to live from relationships with the roots of surrounding conifers. As I progressed up the trail, I noticed the characteristic wing flicking of spider wasps (Pompilidae). Four or five small pompilids were very interested in a small area on the side of the trail, maybe a few inches in diameter. Most pompilids hunt spiders to paralyze and feed to their young, but some are kleptoparasites of other pompilids. I found one such kleptoparasitic pompilid last year. I can't help but wonder if these too were kleptoparasites attracted to the hidden burrow of another pompilid. Finally, and arduously, I reached the subalpine zone. The trees are sparsely distributed, dwarfed, and contorted. Soil, if you could call it that, is highly mineral, mostly sand and fine gravel. Wildflowers were blooming everywhere in pockets between large rocks. Deep roots keep the plants anchored in the loose dry substrate. Hiking at this stage becomes challenging, and the trail is frought with many obstacles. This is when the fun begins. Life high on the mountain is hard for plants. Prolonged snow cover, harsh weather, strong wind, loose soils, a short growing season, and animal predation creates a very trying environment for high elevation plants. Most of these plants cope by having deep extensive root systems and small above ground manifestations. Many bloom very quickly as soon as weather permits to cope with the short growing season. Summer for us in the lowlands is spring on the mountain. The trail becomes slightly harder to follow as one gets higher on the mountain. It's not that there isn't a discernable trail, but that there are many discernable trails, likely from hikers that came before you that went the wrong way. My view is that it is hard to get lost going up. All you have to do is just go up. Going off the beaten path might make the ascent more difficult, as was my case. This was partly due to my desire to A.) see more wildflowers, B.) explore my own limitations, and C.) avoid other hikers. During my hike, the most numerous wildflowers were a few species of Eriogonum, or wild buckwheats, namely E. marifolium and E. pyrolifolium. The yellow flowered E. marifolium is interesting in that it is dioecious, that is, plants are either male or female. Female phenotypes have flowers which turn red as they age, while male phenotypes have all yellow flowers with a shorter corolla. In my observations, eriogonums are visited by a wide range of pollinators. While there were bees present on many of the mountain wildflowers, the most conspicuous floral visitors were spider wasps. Large and small pompilids were on nearly every eriogonum I encountered. In other words, sit and watch an eriogonum and within a minute there would be at least one, sometimes two, pompilids on the flowers. Spider wasps are some of my favorite wasps. Not only do I think their way of life is brutal and cold (AKA very cool!) but they have a beautiful form. While they are rarely brightly colored, they do attract attention by their rhythmic wing flicks and jolty movements. Some species are known to have painful stings, something I would like to explore in greater detail. Eriogonum pyrolifolium has an odd common name: dirty socks. The internet claims it is a tip of the hat to their delightful smell. I haven't thought to give them a whiff. Yet. Maybe the next time I see these flowers I will remember to smell them. Davidson's penstemon is found in varying elevations on the mountain, normally in rock crevices. It is probably exclusively visited by bees. I have not seen any pollinator but various bees visit it on my various hikes up the mountain. Paintbrush are strange plants. They are thought to be parasitic on the roots of other plants growing nearby. Flowers are hidden within bracts that must be folded back by bees to access the nectar. Osmiine bees and bumble bees were foraging on them during my hike, and interestingly enough, it was the first time I've seen any pollinator visiting Castilleja. Ammophila nest entrance, covered by a single pebble. Thread waisted wasps (Ammophila; Sphecidae) are pretty awesome, and plentiful on Mount McLoughlin. They are fairly nervous creatures. Their nests, which are provisioned with paralyzed caterpillars, are constructed in sandy soils. They have the peculiar behavior of using a pebble to cover the entrance while they are looking for prey. When the nest is provisioned and eggs are laid, the entrance is covered completely by sand and debris to hide any sign of a nest to discourage parasites. By a stroke of luck, I happened to be sitting and drinking some water on the scree when a thread waisted wasp alighted right next to me. She removed the pebble covering the entrance to her nest (which I hadn't noticed previously) and proceeded to continue excavation. When thread waisted wasps are excavating their nest tunnels, the excavated sand is deposited away from the entrance of the nest so as not to draw attention to the location of the nest entrance. Partridgefoot (Luetkea pectinata) is a plant that seems to grow exclusively on the south facing scree. I haven't ventured onto the northern or western slopes to determine if it grows there, too. Flies sem to have been the primary pollinators, though bumble bees were also seen on the flowers. Did I mention it was hot? It was hot. I was staying hydrated, but a pounding headache was making the already difficult trek even more difficult. I started to feel like Frodo on Mount Doom trying to deliver the One Ring to the firey pit from whence it came. At this point my entire body was jelly and I was questioning my life choices. Eriogonum pyrolifolium near the summit with... a honey bee?! Yeah. I get within ten minutes of the summit and I see a honey bee. Why did I not see a single honey bee anywhere else on the mountain? Where did she come from?! I wonder if she was from a managed hive somewhere at the base of the mountain, or a feral colony hidden within a rock crevice or tree hollow. The mystery will haunt me until I die. A tiny wasp lands on me once I reached the summit, Platygastridae? I have long since unlearned the habit of immediately brushing off an insect that finds its way onto my skin. First, I look to see what it is. In this case, it was a tiny wasp! The quality of the photo is probably too poor to ever get a positive ID, but knowing that wasps are equally attracted to me as I am to them makes my heart happy. So, I made it to the summit. It was epic! There were exactly zero plants growing on the tip top, but there must have been thousands upon thousands of insects; mostly flies and horntails. Woodwasps, sawflies, and horntails are ancient phytophagous (plant feeding) progenitors of wasps. Siricid woodwasp larvae feed on decaying wood of conifers.